NEW YORK (AP) — Baseball has transformed at dizzying speed since Edgar Martinez took his final swing and Mike Mussina, Mariano Rivera and Roy Halladay threw their final pitches. When Mussina retired Boston’s Dustin Pedroia on a double-play grounder to end his final outing in 2008, a start that made him a first-time 20-game winner at age 39, strikeouts in the major leagues totaled 32,884. That broke a mark that had stood since 2004. When Martinez took his final swing in 2004, grounding into a double play against Texas reliever Brian Shouse, infield shifts weren’t even totaled, employed only for a few lefty pull hitters like Red Sox slugger David Ortiz. Baseball’s Analytics Age, the successor to the Steroids Era, had just begun by 2013, when Derek Jeter and Andy Pettitte walked to the Yankee Stadium mound to remove Rivera. The closer left in mid-inning against Tampa Bay to tears and cheers in what turned out to be his finale, after Yunel Escobar had flied out. That month also marked the final appearance of Roy Halladay, who died in a plane crash 14 months ago and was elected posthumously on Tuesday. 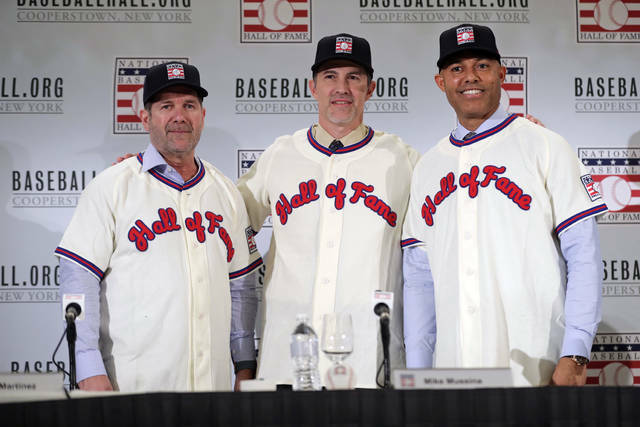 The Hall of Fame is baseball’s annual celebration of itself. 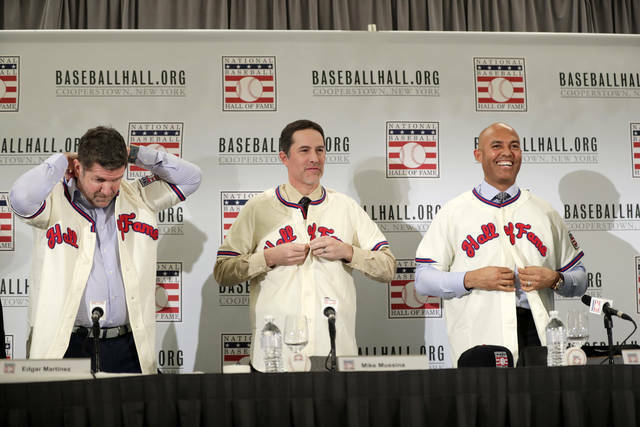 Hall President Jeff Idelson saluted its exclusivity: Among 19,429 major league players, just 232 have been chosen for the Hall, including 132 from the Baseball Writers’ Association of America annual ballot, which requires a supermajority vote. 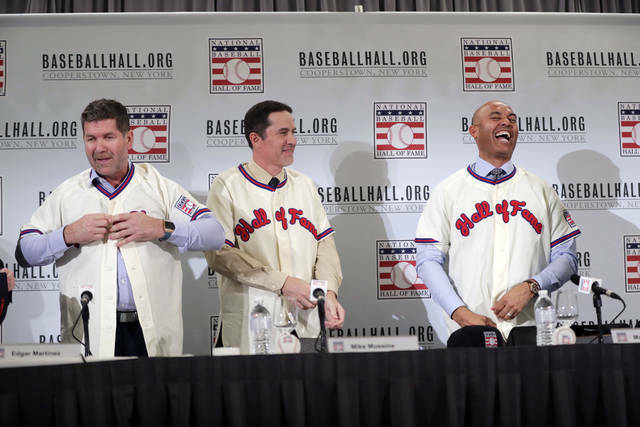 “It is important to note that the magic number remains 75 percent, a figure never attained by anyone who lived in the White House,” BBWAA secretary-treasurer Jack O’Connell said. Having achieved the greatest at the highest level, perhaps these players’ thoughts should count the most when it comes to the sport’s evolution. Glowing a day after their elections, Rivera, Martinez and Mussina smiled and joked. Rivera recalled getting fined by the Yankees’ kangaroo court for showing Halladay the grip he used for his cutter. “I had no shoes, so we had to be playing barefoot,” he said. Martinez struggled through his first five big league seasons with Seattle and didn’t become a consistent top hitter until shifted to designated hitter at age 32, a move he initially fought, fearful a bad year at the plate could end his career. Rivera and Mussina were former New York Yankees teammates, and Rivera and Martinez are tied by the batter’s unusual success against him. Martinez hit .579 (11 for 19) off Rivera with three doubles, two home runs, six RBIs and three walks. Not so fast, Mussina insisted. Mussina’s 270 victories included 49 that were saved by Rivera — the reliever’s second-most for a pitcher behind 72 for Andy Pettitte. Super Bowl season is like the holidays — a celebration shared by people more accustomed to arguing than sitting down together. As one of the few transpartisan, mass media events left to our tribal culture, the biggest TV night of the year can’thelp but channel the political tensions most of us endure all year long. This year, pop superstar Rihanna turned town the Super Bowl halftime show, citing the NFL’s crackdown on protests of racial discrimination. For the same reason, comedian Amy Schumer publicly swore off doing any commercials. In fact, professional football has been deeply politicized for years. Maybe you didn’t notice before Colin Kaepernick took a knee, but the fact that one guy on one knee sparked a national firestorm highlights the politics of the stage he actedon. That year, the Pentagon was gearing up for a major troop surge in the Afghan war, which even 10 years ago was already old, unpopular and largely forgotten. It needed recruits, and it needed a compliant public. It was only in this atmosphere that a simple, silent protest of police brutality and racism could be construed as an attack on “our troops” — as opposed to, say, police brutality or racism. Despite this thoroughly political staging, it was onlyKaepernick and his supporters who were attacked for “bringing politics” into football. That’s no comfort to the beleaguered football fan (or their friend who just watches for the commercials). But even if nobody deigns to kneel during the anthem, and even if advertisers and halftime performers play it safe and boring, you aren’tbeing spared politics. You’re swimming in it. Somewhere outside that billionaire-owned, taxpayer-funded stadium (hey, that’s political too), your neighbors are living with poverty, racism and violence. Farther afield, thousands of troops remain mired in countless forgotten battlefields, while innocentpeople abroad endure another year of war. Peter Certo is the editorial manager of the Institute for Policy Studies. He wrote this for InsideSources.com. Opinion: Has the Super Bowl Become Too Political? Well, let’s take a timeout and consider that the NFL got blitzed at the beginning of the 2016 season. It all began when San Francisco 49ers quarterback Colin Kaepernick decided not to stand during the playing of the national anthem before thestart of the final preseason game. Meanwhile, the “take a knee” issue shot to the forefront of the nation’s (already heated) societal discourse. Polls revealed that a majority of Americans opposed the reason behind the players’ decision to kneel, although a vast majority saidthey have the right to do so. In the ensuing years, the tenor and tone of the so-called kneeling debate has vacillated more than a rookie quarterback’s performance on any given Sunday. Players have referred to the NFL as a modern-day plantation and to NFL team owners as slaveowners. Last time I checked, slaves have not typically been paid millions of dollars to play a child’s game, as NFL players are. LAS VEGAS (AP) — This goal-mouth scramble might have had some real bite to it. Nashville defenseman P.K. Subban accused Vegas forward Pierre-Edouard Bellemare of chomping on one of his fingers during a scuffle late in the second period of the Predators’ 2-1 victory Wednesday night. Subban said he reached around Bellemare’s head to try to pull him away from Juuse Saros after the Nashville goalie covered the puck, but did not put his finger anywhere near Bellemare’s mouth. Subban immediately grabbed his right hand, shook it and then showed it to referee Jake Brenk. Subban appeared to have droplets of blood on his jersey. Bellemare also appeared to have cuts on his lip. Bellemare wasn’t penalized — but Subban was after the defenseman got into it with Vegas forward Ryan Reaves a few moments after the initial skirmish. Subban was called for roughing and unsportsmanlike conduct, while Reaves was also penalized for unsportsmanlike conduct. “I don’t know how I walk out of there with four minutes in penalties,” Subban said. “They tried to apologize after the fact, but they already gave me four minutes in penalties. My finger is bleeding.